The Childhood Obesity Plan was launched in 2016 and June 2018 has seen the launch of its second chapter. The aim of the strategy is to improve children's health and enhance their chances in life through addressing diet and physical activity. Schools have an important role in defining habits and helping their pupils make healthier life choices. Research has proven that obesity rates double in primary school years and increase further in secondary schools. Schools need to equip children with the knowledge they need to lead healthy lifestyles and creating environment which encourage their pupils to eat healthy and be physically active. Regular physical activity has linked not only to improved physical health but also mental wellbeing and academic attainment. The Chief Medical Officer recommends all school-aged children get at least 60 minutes of physical activity every day. However we know that only approximately one in five achieve this. Schools need to be ensuring that the least active children are being encouraged to be more active. The strategy recommends that during the schools day, schools should be responsible for delivering at least 30 minutes of the total recommended 60 daily minutes of moderate to vigorous physical activity. As well as encouraging children to be active while in school, travel to and from school can also be used as an opportunity to increase children's physical activity levels. The strategy highlights that the government will be increasing the funding that is provided to the Walk to School Project, the cycling and walking investment strategy and the Bikeability scheme. A broad and balanced school curriculum should provide opportunities for pupils to develop knowledge and understanding of a range of health related matters. The strategy recommends that in PE, pupils should not only participate in sports and physical activity but also are taught the long term health benefits of physical activity. Our local version of the Daily Mile called Leicestershire Daily Boost designed to support children and young people in schools to become more active. Promoting and providing School & College Active Travel to and from school. 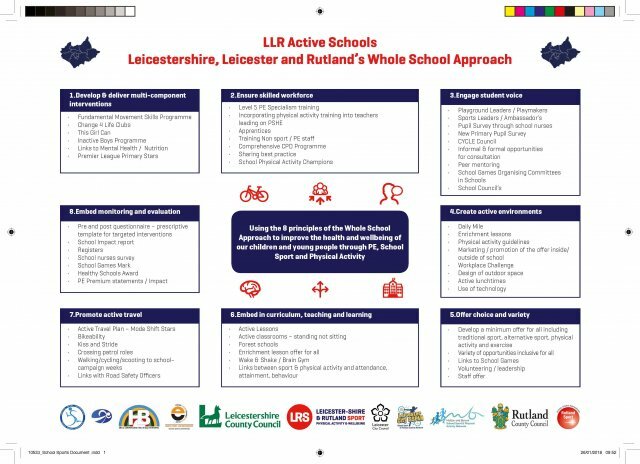 Enhanced Healthy Schools Status - Whole School Approach to Physical Activity Leicestershire Schools can choose to implement the approach with your SSPAN and achieve enhanced healthy schools status.